My brother-in-law who is a reserve soldier along with over 100+ reservists in the IDF’s 360th Tank Battalion currently stationed just outside of Gaza, called me Friday morning. He said his troops, who were summoned into duty leaving behind their families – wives and children, a few days earlier, were running short on supplies. In truly heartwarming fashion, friends of Israel from around the world replied quickly and within 36 hours I had secured nearly 20,000NIS in pledges to purchase those items for the troops. The response was nothing short of overwhelming. This morning I traveled down to Sderot to meet the unit’s Sargent Major and logistics coordinator or רס”פ – Leor. My heart sank leaving Gush Etzion, as it always does these days when I pass the bus stop where ‘our boys’ were kidnapped from, and murdered HY’D by Hamas terrorists just several weeks ago. Despite the situation in the South, everything in Sderot seemed business as usual. The outdoor market (shuk) was open and had plenty of foot traffic, and driving students seated alongside their instructors were slowly making their way through the city. Even with the occasional “booms,” most likely from IDF operations in Gaza just several kilometers away, the people of Sderot have become accustomed to such sounds, after years and years under fire, and were simply ignoring them going about their business. Probably the only thing out of the ordinary was the gaggle of journalists with their television cameras mingling in the center of town, waiting for the next rocket to come crashing down in order to spring into action and start filming. After shopping at the Bizarre with funds still available, we headed over to the local supermarket to load up on toothbrushes, toothpaste, Turkish coffee, garinim (sunflower seeds), shampoo, and more. The supermarket staff also gave us VIP treatment since they knew the items were for the troops, and were busy taking turns going back and forth to the store’s storage room to bring back boxes of products. They even helped us wheel the overflowing carts out to the parking lot for Leor to load into his SUV. Once his car was completely full he was forced to call another soldier from the base to meet us in Sderot with his car in order to pack the remaining items. Following several hours with Leor, we parted ways, with Leor heading back to base, and myself getting into my car for an hour-long ride back to Jerusalem. It hit me on the way out of the city that despite the many sirens reported in surrounding areas, I had made it out of Sderot on this day without experiencing the dreaded Tzeva Adom and having to run for shelter in 15 seconds, something I have done many times before. And that’s when things changed. As I headed north, the newscaster on Galei Tzahal announced that the alarms were currently blaring in the city of Ashkelon just several kilometers to the West. I looked out my window and in horror saw the contrail of some sort of a projectile. 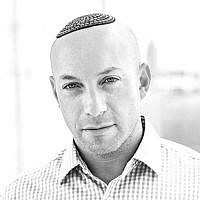 Was it a rocket crashing into Ashkelon? Perhaps it was the Iron Dome Missile intercepting an incoming rocket? Either way it looked surreal, like something out of a Star Wars movie. To my dread, only several minutes later, the radio reported that a teenage boy had sustained severe injuries to his chest and head from pieces of shrapnel from a rocket launched by Gazan terrorists and he was listed in very serious condition. But while I was so close to that horrible incident, I was truly a world away. The roads were full of motorists traveling in various directions, and farmers of the south were working their fields uninterrupted. In a country where every single town and village is now in rocket range, this unassuming false sense of security is unfortunately the norm. Arriving back in Jerusalem, Leor called me with many words of thanks from the troops. He said that whatever his unit didn’t need, he gave to a lucky group of Nachal Brigade soldiers stationed in the same area. 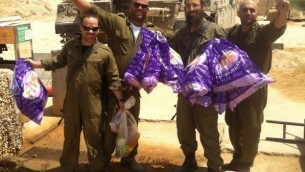 He then whatsApped me pictures of the ecstatic soldiers holding their care packages. The whole experience I feel is the least that I could do, along with the dozens of others who got involved by donating, in order to play our small role in helping our guys on the front lines. A new campaign has been launched in order to continue to provide necessary items for our troops, in what might be a long and arduous military operation. 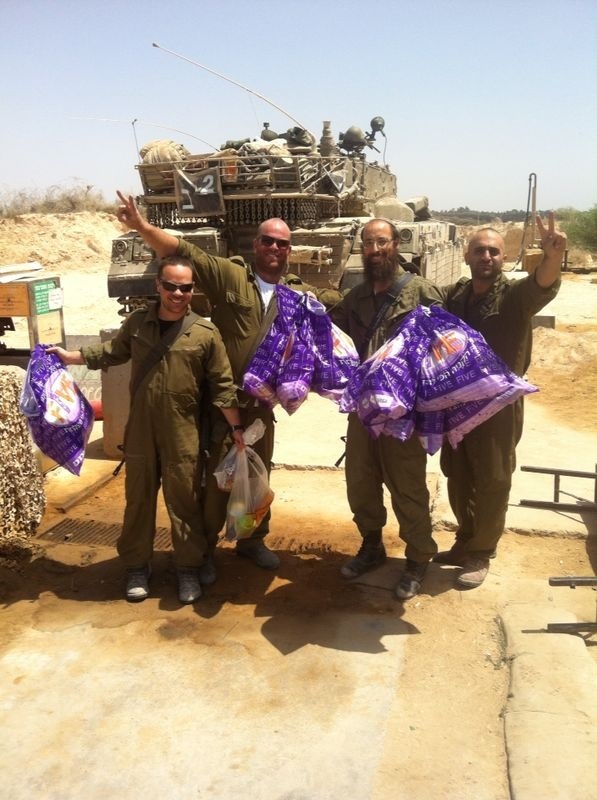 To get involved in the campaign and support our IDF soldiers, click here.